Holly and I often have quiet Thanksgivings. 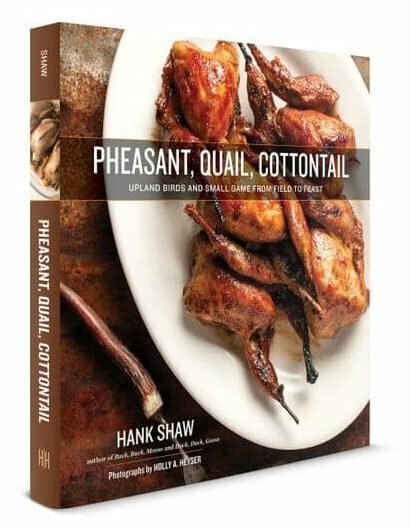 Many times we wake up early, head out to hunt rabbits or ducks for a little while, then kick back with some football and an easy dinner. Roasting a whole turkey, especially a wild one, is not what I call an easy dinner. But you gotta have turkey with gravy on Thanksgiving, right? True enough, but who says you have to have the whole turkey? 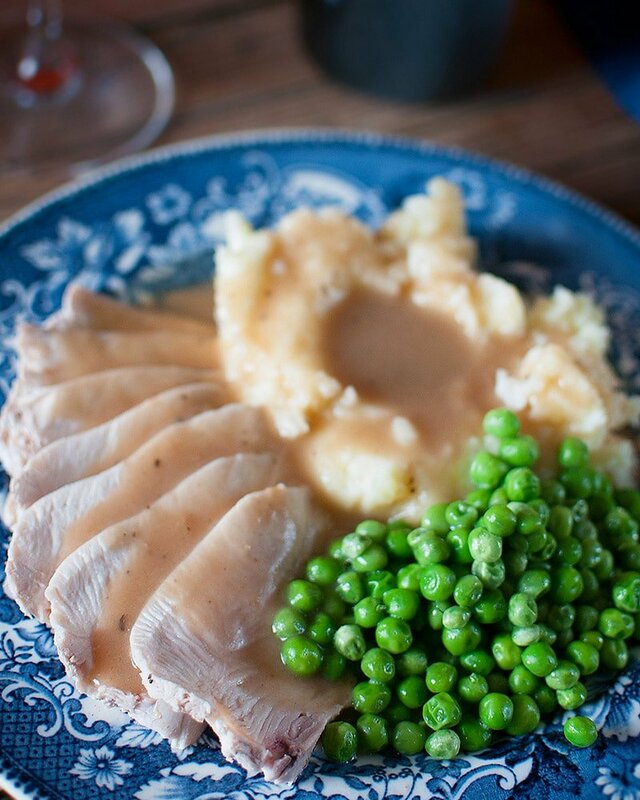 This is an easy way to have a lovely Thanksgiving for a couple or small family. I am using wild turkey here but any sort of turkey you can find will work. For the full-on recipe, you’ll need a couple turkey wings (skinned or plucked) to make some broth (and to help the gravy), but you can use store-bought chicken broth instead. We like to use a full turkey breast, which runs about 2 1/2 pounds, but you can cut it in half if it’s just the two of you. What makes this different from everyone else’s “simple Thanksgiving menu” is the way I cook the turkey and the gravy. You start with the gravy, which hinges on sherry and those roasted turkey wings that are turned into a simple broth — but again, like I said, you can use regular chicken broth instead. But you need enough broth so you can poach the turkey breast very gently. Poaching keeps the meat super moist, and is infinitely better for a piece of skinless breast than roasting or pan-frying. Finish it off with some simple mashed potatoes and a vegetable of your choice and there you have it: Traditional, with a bit of modern technique. 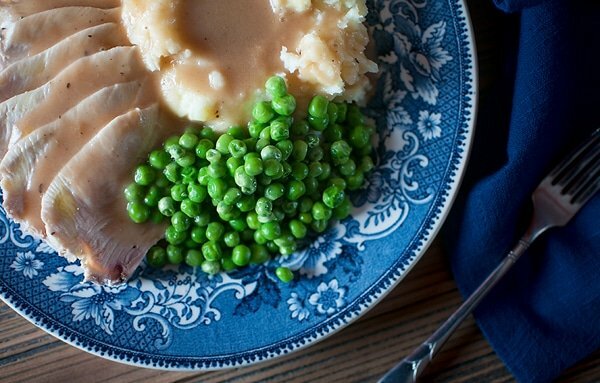 Even if you skip the Thanksgiving gravy and side dishes, I urge you to cook turkey breast this way: It is SO much moister and really lends itself to whatever gravy or sauce you feel like using that day. Perfectly poaching a wild turkey breast is easy, but you need to know a few tricks before you begin. First, start with meat that is room temperature. This means taking the breast out of the fridge and letting it sit for 30 minutes. Second, quick-cure it by salting the breast heavily on both sides when you take it out; this seasons the meat as it comes to temperature. Third, use a good broth. And finally, never, ever, ever let the broth even simmer. You just want it to steam at 155°F to 165°F. If you let this boil or even simmer strongly, the meat will dry out and get tough. Incidentally, if you want a stronger gravy than this one, try my maple bourbon gravy, which I normally serve with duck, but which also works well with turkey. If you are making the broth, preheat the oven to 425°F. Coat the turkey wings in the vegetable oil and salt well. Roast in a cast iron frying pan or other oven-proof pan until nicely browned, from 45 minutes to an hour. Put the roasted wings in a pot with all the other ingredients for the broth and bring to a simmer. Simmer gently until the meat wants to fall off the bones. This will take about 90 minutes with a domesticated turkey, longer for wild. You can pick off the meat and eat it later, or you can chop it up and put some in the gravy, too. Once you have the broth made, take the turkey breast out and salt it well. Let it sit on a cutting board for 30 minutes or so to come to room temperature. Bring the broth to a simmer and drop the turkey breast in. The turkey should be submerged by the broth. If it is not, add water or chicken stock. Once the turkey is in the broth, move the pot to your weakest burner and turn the heat to its lowest setting. Cover the pot and let it steep in the hot broth for at least 30 minutes, and up to 1 hour if you are using a full half breast. Remember to never let the water simmer! You are looking for a target temperature of 155°F to 165°F. So long as you are in that ballpark, you will not overcook the turkey. 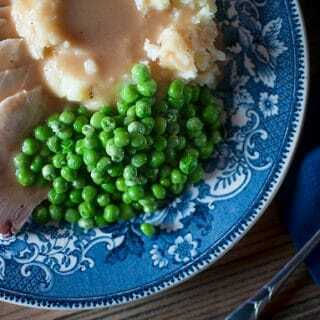 Make the gravy while the turkey is poaching. Heat the butter in a small pot over medium-high heat. When it's hot, add the flour and mix well. Cook this, stirring often, until it smells nutty and turns milk-chocolate brown, about 10 minutes. Stir in the sherry. The mixture will seize up, so slowly stir in 1 cup of the hot broth until the gravy has the consistency of melted ice cream. Add salt, black pepper and Worcestershire sauce to taste. Turn the heat to low and stir from time to time. If it gets too thick, add a little more broth. To check if the turkey has cooked all the way through, either test it with a meat thermometer -- you want it to read 150°F -- or slice the thickest part and look: You want a blush of pink in the meat. Slice and serve with mashed potatoes and a vegetable of your choice. Ladle over lots of gravy! Steve: I bet you could do that. But you want to watch the salt levels. I feel that cooking it in the brine might make it salty. Not sure, but that’s my gut feeling. And yes, I may well return to Mulefoot in 2018! Bill: Wow, that seems awfully long for a turkey breast. My version takes closer to 35-45 minutes.